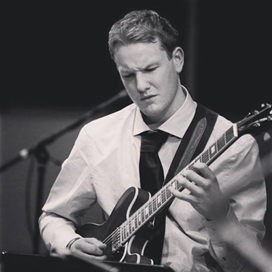 Gareth Fowler is one of the busiest young jazz musicians working in the Midlands, and has been described by Tony Dudley-Evans (Co-ordinator for Cheltenham Jazz Festival/Jazzlines Symphony Hall) as one of the area’s ‘brightest prospects’. Sought after for both his virtuosity and passion as an improviser, he performed at the Cheltenham Jazz Festival with leading US saxophonist Chris Potter’s band, and has toured in South Africa (with the Global Voices Project), Denmark, Germany, and Norway. He leads various bands, writes his own compositions, and has featured on many recordings. He regularly performs with fellow up-and-coming names such as Daniel Bayliss, Euan Palmer and Alex Woods; while remaining a first-choice for visiting luminaries such as Gilad Atzmon.